EXPERIENCE THE ADVENTURE CAPITAL OF THE WORLD, WITHOUT BREAKING THE BANK. When you think of Switzerland, many images spring to mind. On one hand you have mind blowing snow-capped mountains, endless rolling green hills, and fine chocolate. On the other hand, you have visions of empty wallets and blowing your savings before you get out of the airport. If you’ve been following along, you’ll know that the team at Get Busy Living are adventure driven and lifestyle hungry! This calls for getting creative with the way we spend our money. We’ve learned a few tricks that we hope will help you find things to do in Interlaken and get the most out of your stay in Switzerland. Interlaken is known as the world’s greatest adventure destination for good reason. There are endless activities for all types of travellers and many you can discover on a budget. Getting around adds up fast so whatever you do, don’t overlook this free transport offer. 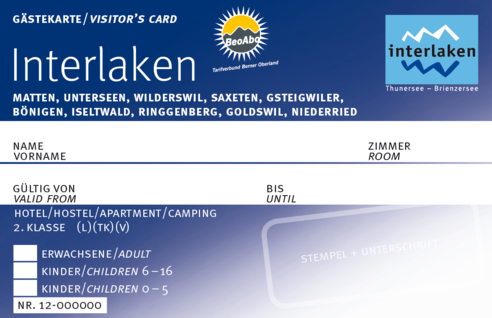 As soon as you arrive in Interlaken, ask your hotel or hostel reception for a guest card. You can also ask if there are any ‘holiday passes’ which might be useful for your travel plans in Switzerland. The guest card will give you free transport throughout the regional zones as well as Iseltwald, Saxeten and Niederried. Let’s kick things off with a freebie! 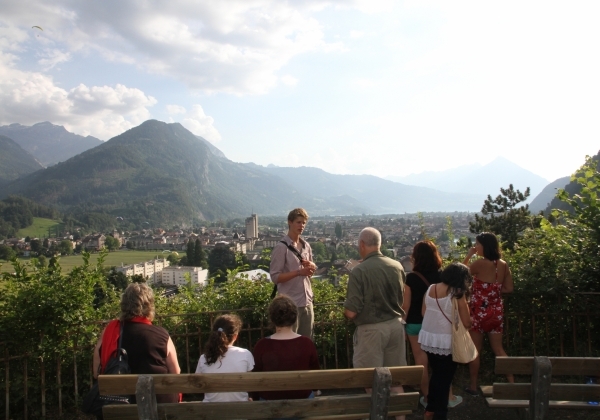 The free Interlaken walking tour is a great way to start your holiday in Interlaken. You will have local experts guide you through town and its surrounds. The walk takes you to some of the best views and you get to meet some awesome people! Let the locals give you all the insider tips for what makes Interlaken so special. *Come rain or shine, weather doesn’t stop the guides from showing you a good time! 20,000 litres of water per second !!! 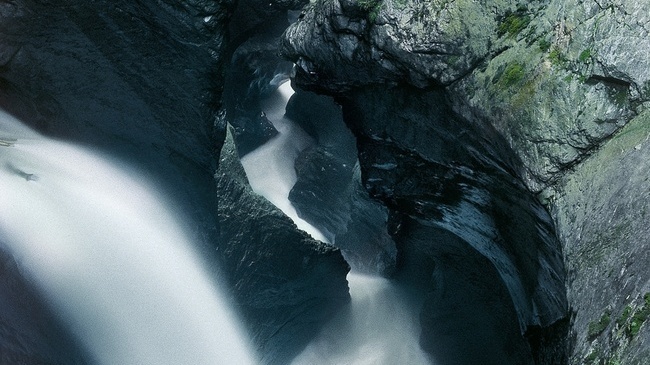 The Trümmelbach falls are a series of ten glacier-waterfalls inside the mountain. You can access them by a well-lit tunnel lift. Interesting History: Kaspar von Almen has spent most of his 76 years living next to the falls. The sound is a melody that he never grows tired of. We have Kaspar’s grandfather to thank for making the falls accessible by a series of walkways and bridges in 1877. Since then millions of visitors pour through the tunnels and stare at the falls in amazement. Kasper, in his younger days, discovered a series of caverns which had never been seen before. This prompted his father to drill deeper into the mountain. Kasper continued the excavations, completing the tunnel and allowing visitors to ascend nearly 600 meters inside the Trümmelbach Gorge. There’s nothing that quite compares to being that close to the power and force of the water, thundering and spiralling its way through the rock. For a great write up on the falls with lots of photos and videos take a look at this article. 20mins walk through the gorge. We recommend spending more like 1hrto fully appreciate the falls. The entrance is between Lauterbrunnen town and the cable car station leading up to Gimmelwald, Murren, and Schilthorn (it’s right in front of Murrenbach Falls). The short bus ride from either stop typically leaves at 30 min intervals (it takes over 30 mins to walk the 3km distance between the stops from either side). The bus drops you off in front of the Trummelbach Cafe, where you walk a short distance past some signs and along a little meadow before reaching the gate where you pay for admission. Note that the buses are free to Wilderswil with your guest card from Interlaken Tourism. 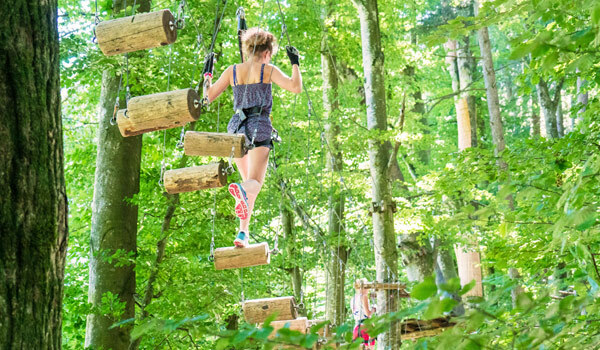 If you remember back to the beginning of this post, we mentioned that Interlaken is the world’s biggest adventure playground. There are no shortages of thrill-seeking experiences to be had so why not take advantage of a package deal to save some cash! Outdoor Interlaken offers a huge range of different packages to suit every budget and here are a few examples. 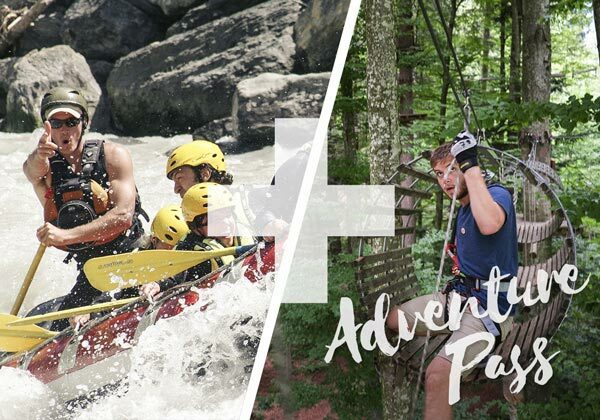 With an adventure pass, you can pick and choose from a combination of activities. An example might be the Adventure Park. Then select a second activity such as canyoning! An adventure pass is 2 activities. 1 activity + your choice from 4 other options. Are you a fan of James Bond? Take advantage of the Thunderbolt Package which gets you 2970m high onto the summit of Schilthorn and a choice of rafting or canyoning as a second activity. Schilthorn Piz Gloria is where the James Bond film “On Her Majesty’s Secret Service” was set. There is an interactive exhibition at the summit as well as a Helicopter simulator! SAVE OVER 100 CHF !!! No compromises. No messing around. This is the one for those of you who want to do it all! You get the best of the best, and it works out a lot cheaper when booked as a package deal. Check out what’s included. There is also a “lite” package for those who’d rather not jump out of a plane and go paragliding instead. There are a couple of ways you could do this. You could either get transport out to Neuhaus or walk it. It’s not that far (around 5kms) and the path is fairly flat, taking you around 1hr 10 each way. 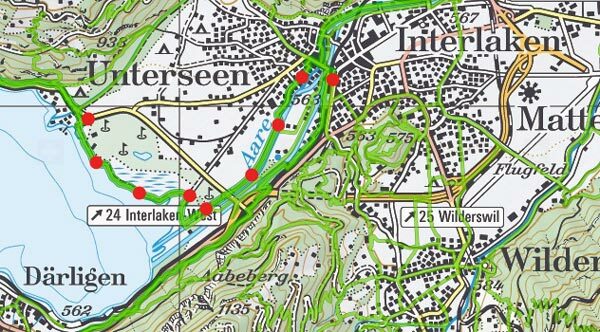 It’s a beautiful walk starting from Interlaken West station through wild vegetation along the river banks, past green meadows, and large fields. The walk takes you through light forest and paths of ancient trees all the while looking up at the spectacular mountain panorama beyond the river. You’ll then pass the medieval fortress ruins at the mouth of the river Aare and onto lake Thun via wooden walkways. Once you get to the lake, you continue along through the nature reserve of Neuhaus-Weissenau which is full of various plants and flowers. This path finishes at a picture perfect lakeside park. We recommend hanging out here for the rest of the day as the adventures have only just begun! You can always wind down the day with a cruise on lake Thun back to Interlaken. For more information on lake cruises, BLS has you covered. Let me introduce you to Mountainsurf. NOTE: If you’re up for some water sports, you’re best to give the guys at mountainsurf a quick call +41 (0) 79 789 57 32 to see if there’s anything specific you’ll need for each activity. Click on the map below to see the routefrom Interlaken to Neuhaus. The Butterfly Walk is great for kids and parents, and a fun way to partake in the tree challenges without needing a harness.d here are a few examples. Every day, any weather. Exceptions are heavy fall of rains, severe wind and thunderstorms. Call +41 (0)33 826 77 19 for up-to-date information. Setting out with a smaller budget doesn’t mean sacrificing the enjoyment of your trip. There are still plenty of amazing adventures and experiences which won’t break your bank account and might even get you closer to the local culture. Of course, you can’t expect to travel for absolutely nothing but we hope that some of these ideas have peaked your interest and will help you to get the most out of your holiday in Interlaken.